Scottsdale, AZ, January 4, 2017 – Roboteq, Inc (www.roboteq.com) introduces a new magnetic guide sensor capable of detecting and reporting the position of a magnetic field along its horizontal axis. The sensor is intended for line following robotic applications, using adhesive magnetic tape to form a track guide on the floor. Measuring only 165 x 35 x 35mm, the MGSW1600 is built into a rugged, watertight, all-metal enclosure. It uses an 8-pin waterproof M12-type connector for its power supply and IO signals. The sensor uses advanced signal processing to accurately measure its lateral distance from the center of the track, with millimeter resolution, resulting in nearly 160 points end to end. Tape position information can be output in numerical format on the sensor’s RS232, CANbus or USB ports. The position is also reported as a 0 to 3V analog voltage output and as a variable PWM output. Additionally, the sensor supports a dedicated MultiPWM mode allowing seamless communication with all Roboteq motor controllers using only one wire. The sensor is primarily used to steer Automatic Guided Vehicles (AGVs), moving material on factory floors. However, its unique sensitivity and accuracy opens a world of new application opportunities, such as automatic shelf replenishing in supermarkets, patient transport in hospitals, stage theater props, or rail-less tramways. Compared to other guiding techniques, magnetic guides are totally passive and therefore easy to lay and modify. The tape creates an invisible field that is immune to dirt and unaffected by lighting conditions. The magnetic track can be totally hidden under any non-ferrous flooring material, such as linoleum, tiles, or carpet. Roboteq provides drawings, How-To videos and software free of charge for building Magnetic Track Guided mobile robots. Roboteq’s RoboAGVSim is a software package that lets the user develop and simulate such robots. The sensor will detect and manage up to 2-way forks and can be instructed to follow the left or right track using commands issued via the serial, CAN or USB ports. All of the sensor’s operating parameters and commands are also accessible via its CAN bus interface. 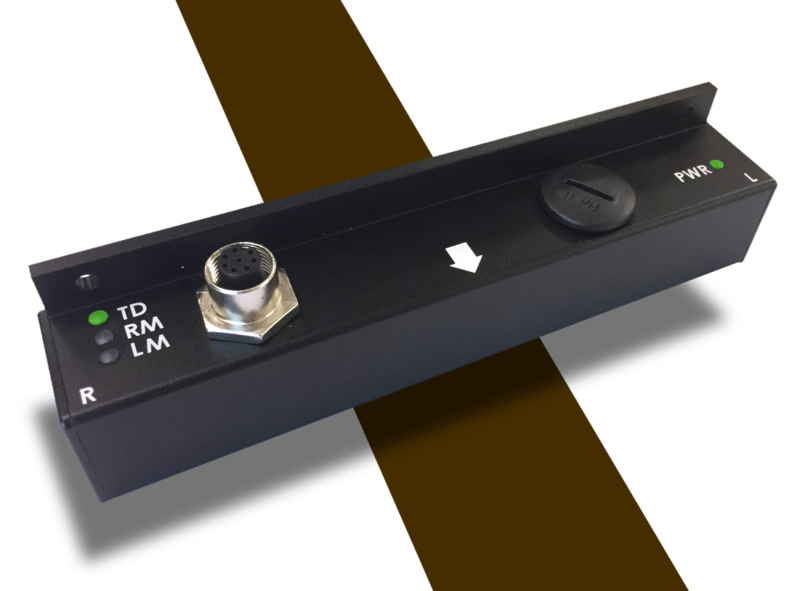 In addition to detecting a track to follow, the sensor will detect and report the presence of magnetic markers. Markers are pieces of tape of opposite magnetic polarity that may be positioned on the left or right side of the track. The sensor is equipped with four LEDs for easy monitoring and diagnostics. The sensor incorporates a high-speed, Basic-like scripting language that allows users to add customized functionality to the sensor. A PC utility is provided for configuring the sensor, capture and plot the sensor data on a strip chart recorder, and visualize in real time the magnetic field as it is “seen” by the sensor. The sensor firmware can be updated in the field to take advantage of new features as they become available. Roboteq sells adhesive magnetic tape of 25mm and 50mm width, in 50 meter rolls. These are available from our online store. Dieser Eintrag wurde veröffentlicht in English, General und verschlagwortet mit AGV, magnetic guide, Roboteq, tape von Sebastian Trella. Permanenter Link zum Eintrag.